This is not the church. 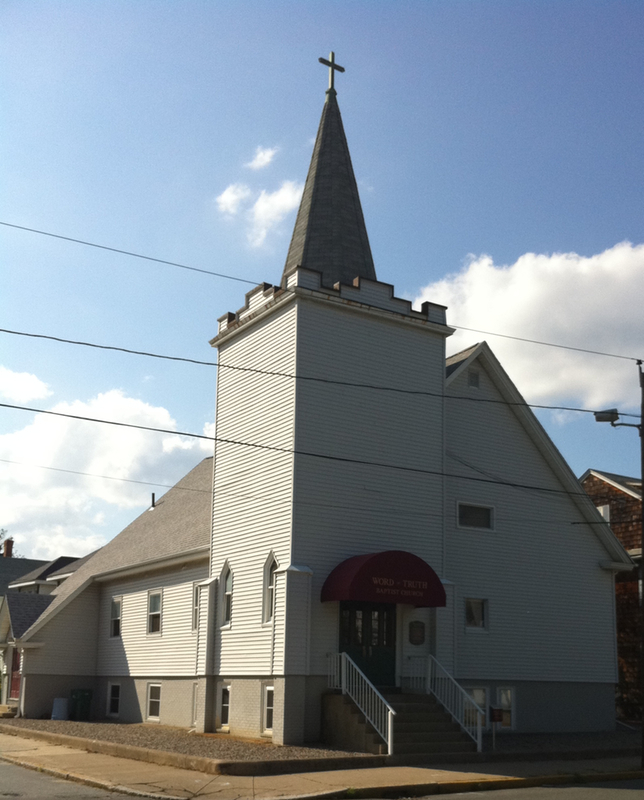 This is the meetinghouse where the church gathers together. 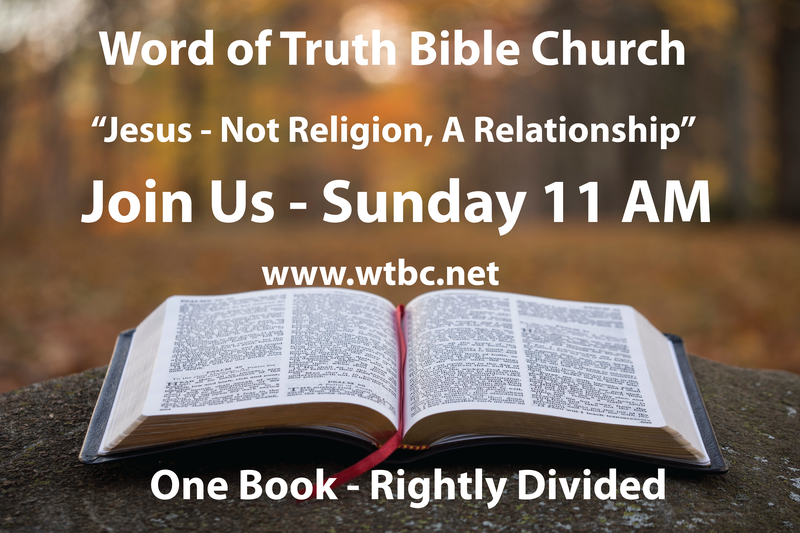 The Word of Truth Bible Church is a fellowship of individual believers in Christ who have banded together to promote "the gospel of the grace of God" and the Word of God, rightly divided (Acts 20:24; 2 Timothy 2:15). The purposes of the Word of Truth Bible Church are to win the lost to Christ, and to edify, unify, and equip individual believers in the way of the Lord more perfectly according to the revelation of the mystery given to the Apostle Paul for the body of Christ. Our church teaches that Christians are to "hold the traditions" which were taught by Paul to the body of Christ. We believe the entire Bible is for us, but not necessarily to us and that rightly dividing the word of truth as commanded by the Lord through Paul, the Apostle of the Gentiles, is the only way to avoid mis-applying Biblical truths that are not present truths to the body of Christ. The Apostle Paul tells us that the things written before are for the Christians to learn to have hope through the patience and comfort of the scriptures. We also find that historical traditions contained in the writings and teachings of men are a poor substitute for Biblical truth and often result in the spoiling of the believer by either bringing them into captivity or destroying them. This website only contains a snapshot of our beliefs, but we hope that it gives you an idea regarding the truths that we believe. This church holds the following statement of faith as being a summary of Christian doctrine whose authority consists only in its agreement with the word of God. The Statement of Faith does not exhaust the extent of our faith. The Bible itself is the sole and final source of all that we believe. We do believe, however, that the foregoing Statement of Faith accurately represents the teaching of the Bible, and therefore, is binding upon all members. No attempt is made in this statement of faith to list scripture references for the doctrines and convictions herein listed as such a practice is more becoming a text of theology than a creedal statement such as this. Neither should these beliefs as listed be necessarily viewed as if in an ascending or descending order of magnitude or importance. We believe the AV 1611 King James Bible to be the perfect and infallible word of God. We believe the word of God is inspired in its origination and preservation; hence divinely preserved throughout its various generations and languages until it reached us in its present form. By this we mean that the AV 1611 preserves the very words of God in the form in which He wished them to be represented in the universal language of these last days: English. Each word is therefore sacred and as such is, in our minds, exempted from the pilferage of presumptuous scholars, whether they be of the Alexandrian variety or of the "conservative," Traditional (Byzantine) type. We believe in the right division of the word of truth, carefully noting doctrinal differences that exist between the various ages in which God has dealt with mankind differently and has given man different responsibilities. As such, we embrace a moderate dispensationalism akin to that of C. I. Scofield of a generation ago and that of P. S. Ruckman of this generation. As dispensationalists, we are careful not to over divide and thereby reject scriptural doctrines. We believe this moderate division of the word is the only legitimate solution to many of the supposed discrepancies in the scriptures. Not dividing the scriptures can lead to a mixture of truth and error, which so often leads to grave heresy. We believe that salvation in this age (church age) is by grace through faith in the blood and finished atonement of Jesus Christ at Calvary as revealed to the Apostle Paul. In this age (church age) man's responsibility before God is to believe the gospel in order for God to impute the righteousness of Christ to him at the moment of his belief. However, man's responsibility in order for God to impute righteousness to him in other ages varies, i.e. ; faith and works in the Tribulation. We believe the Lord's Supper or Communion to be a memorial and not a means of grace. We believe in a pre-millennial, pre-tribulational translation or rapture of the Church. We believe in a universal and invisible Church which is entered into by an individual at the moment of salvation. The agent of this transaction is the Holy Spirit who baptizes that believer spiritually into the Church invisible: the Body of Christ. We believe that the Church is manifested visibly through the local churches. We believe that a visible church of Christ is a congregation of believers, associated by covenant in the faith and the fellowship of the Gospel, exercising the gifts and privileges invested in them by His word; that its only Scriptural officers are bishops (pastors) and deacons, whose qualifications, claims, and duties are defined in the epistles to Timothy and to Titus. This church is an independent local autonomy, governed internally by the bishop and responsible only to the Lord Jesus Christ. And as such stands outside the jurisdiction of any Federal or State governmental authority, however, possesses the ability to voluntarily cooperate with such governments as it deems prudent in accordance with Romans 13. Its ministries include glorifying the Saviour, edifying the saints, and evangelizing the world for Christ. We reject the so-called Baptist Bride positions and their theories on the Church, Baptism, the nature of John Baptist's work, etc. We believe the miracle signs and gifts to belong primarily to Israel, dispensationally speaking, and that these signs as practiced by the Charismatics and Apostolics are exercised mainly in the flesh, are most often fraudulent, and sometimes demonic and devilish in nature. We believe that a depraved and sinful nature and a naturally dead spirit does not hinder a man from being a free moral agent who is capable and expected by God to will and believe and respond to the admonitions of the Gospel. Men are free to reject God's graciousness in providing a free salvation. Further, Jesus Christ died for "all" without exception. We believe a man is secured in his salvation eternally and unconditionally in this age at the moment he believes. This condition is secured by the numerous irreversible works of God and the Holy Spirit. We believe in reaching out to lost sinners by all means consistent with scriptural principals and appropriate methods of sowing the seed of the word of God. We believe the trinitarian doctrine of the Godhead and therefore believe Jesus Christ not only to be the Son of God, but also God Himself, the image of God, God manifest in the flesh. We also find abundant evidence that the Holy Spirit as both God's and Christ's Spirit is Himself God, as well. We believe in a literal, hot and burning Hell. It was prepared for the the Devil and his angels to be their future place of habitation; and serves as the abode for the damned who reject God’s free offer of salvation. UNITED UNDER THE LORD JESUS CHRIST IN ORDER TO FURTHER THE GOSPEL, CONVERT THE LOST, AND PREPARE THE BRETHREN FOR THE COMING OF OUR SAVIOR AND KING. We, the willing members of Word of Truth Bible Church of Attleboro, MA, do hereby covenant and agree before God and our fellow Christians to hold the following biblical admonitions in high regard not only in the presence of the brethren but also before the lost so as to demonstrate the true Christian character and spirituality that the Spirit of God may move among us and them and that our witness, testimony and the words of the living God may be presented in truth with out hindrance from us. That we will submit ourselves one to the other in honor preferring one another. That we will learn to forgive one another even as God for Christ's sake has forgiven us. That we will care for one another, the elder guiding the younger in the Lord, and by work and deed being spiritual examples both to express God's presence and be humbly used as God wishes to strengthen those we have given to our fellowship. That we will pray for one another with compassion and concern, and seek each other's welfare in any time of trouble. That we will unite together to worship in spirit and truth with prepared hearts and minds in joyful communion. That we will continue faithful in supporting the church and it's ministries as we are prospered in obedience to the scripture while seeking no temporal reward but looking for His blessings and love, realizing that if we sow bountifully we will reap bountifully. Further, that it is the words of the scripture and as well as the message and doctrine that are vital and that we possess these words by the mercy and grace of God in the confines of the Authorized or King James Bible entirely and without error. That it is the expressed and clear purpose of this church as all visible churches of true believers, to disseminate, teach, promote, publish, distribute in several forms, proclaim by voice in any righteous manner, and preserve these words as directed and supplied by the Spirit of God, to the fullest extent possible before the resurrection of the Body of Christ in what we know as the rapture, or translation of the saints. That we will consistently seek to win those who are not yet converted to the salvation of Christ not only in this country and location but as far as possible throughout the world in anyway not inconsistent with the teaching of scripture by the power and leadership of the Holy Spirit. That the Bishop shall have the full authority in all matters regarding the church in order that he may exercise the gifts given to him by the Holy Ghost. That the Bishop will seek the wise counsel, as he deems necessary and possible, in order to make decisions for the church and that they will pray that God will guide the Bishop in making those decisions. That we would follow as God directs the leadership of the church through the Bishop (pastor), praying for such leadership, trusting that God will correct and take full responsibility for the man of God, and should disagreement arise that we would follow the scriptural admonition and by grace seek understanding. That this church functions, not as a democracy, but as a body under the Headship of the Lord Jesus Christ and at the direction of the Bishop as the under-shepherd. Members of this church are not individually afforded with any property, contract, or civil rights based upon principles of democratic government except that they may remove themselves at any time that they so choose. If you don't already have a PayPal Acount, you may click to checkout as a guest; and donate using normal credit or debit cards.